To say that The Conduit is eagerly anticipated would be a serious understatement – this is potentially the title that could be the next best thing since sliced Goldeneye. 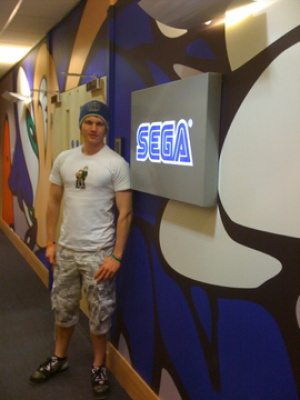 Imagine then the excitement I felt at the opportunity to visit Sega’s London offices to not only give the Conduit’s multiplayer mode a spin but also interview both the CEO and CCO from High Voltage Software, Kerry Ganofsky and Eric Nofsinger. After navigating my way to Sega HQ (a journey that entailed getting lost several times) I was introduced to Kerry, who was taking the rest of the guests through their paces in some frantic multiplayer action. Not wanting to stop for food, I jumped straight into the action in an RPG-ridden death-match, and was blown away – and I don’t just mean by the rocket-propelled grenades! Straight away I realised just how intuitive the Conduit is; after literally 5 minutes of tutelage from Kerry I had the controls nailed. Granted, I died more often than not in the first few matches, but the more I played the game, the more engrossed I became in the whole experience – I nearly even won a match! 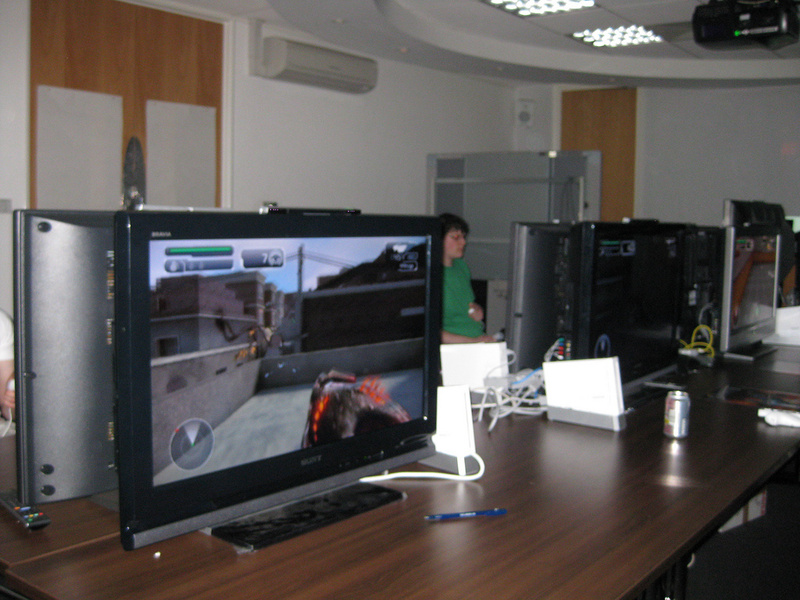 We’ve all seen how much of a tough business it has been to create a ‘true’ FPS on the Wii that works well – Red Steel is the obvious example – so it really puts in perspective the feat that High Voltage Software have achieved. I’ll raise my hands up and say that I am not the most adept at FPSs – I enjoy them, but can never really compete on an even playing level with others; analogue sticks and I do not get on well. But playing the Conduit didn’t feel like any other FPS out there: it felt natural. From shaking the nunchuk to throw a grenade, using down on the D-pad to zoom in on an enemy, and even simple things like pointing the remote to turn around or using A to jump, everything came together exactly how you would want it to. Moreover, the controls are totally customisable to the point where you can create whatever setup you want. It’s a truly unparalleled experience. Visually too, the game shows us what the Wii is capable of with its built-from-scratch engine. Going back to the multiplayer action in the community event itself, I was pitted up against staff from other gaming websites in some fast-paced death-matches. Eight of us were playing over the Nintendo Wi-Fi connection where everything was working seamlessly despite playing a non-final build of the game. After each match we were returned to the lobby where players can vote for the type of game, what weapons will be available, and which map the match will be held on. The range of choice is simply immense, and the different game modes rich and diverse. I didn’t get a chance to sample every aspect of the multiplayer, but everything I tried was truly engaging. There were enough matches to confidently say that this looks to be a truly magnificent multiplayer title – and then there’s the single player mode, which we’ve yet to play but looks incredibly promising. My very first Conduit deathmatch - I even managed a couple of kills! Out of the multiplayer games played, my favourite would have to be the Bounty Hunter mode where each player has a ‘bounty’ to collect on someone else. The objective is simple: you must kill your bounty, but no one else – doing so will result in a deduction of points. This means you can be hunting someone down, while they are hunting someone else, but at the same time another person will be on your tail, and if the hunted kills the hunter then they will lose points – pure genius! We also played ASE (All-Seeing Eye) football, which is a mode where players duke it out to grab the ASE and attempt to hold on to it for the longest. While holding the ASE, you can only use melee attacks and grenades, not to mention your movement also becomes a lot slower, which makes for some truly competitive carnage. Of course, there are your standard death-matches and team death-matches in the mix, so there really is something for everyone here, and potentially enough content to keep players occupied for a long time. After playing the game, I had the chance to interview Kerry and Eric and put across some of the questions that we’ve had regarding the development of the Conduit (expect the full interview to go live soon). What came across strongly in the interview was that the Conduit truly is a game designed by people who have a passion to deliver something the fans want; it has evolved and taken shape based upon feedback and criticism from gamers. Also made apparent was that the Conduit is not just a shooter with sublime controls, but it’s a game that has the balance of gameplay modes, level design and accessibility that helps to distinguish great games from the crowd. And, as if my day wasn’t exciting enough, I got to grips with a copy of the latest Virtua Tennis title for the Wii, Virtua Tennis 2009. From the few matches I got to play, it’s obvious that this is going to be an exceptional tennis game. The simplistic swinging that Wii Sports gave us has been thrown out of the window, and the one-for-one mapping Motion Plus provides is shaping the game up to be a grand-slam success. We’ll have more news on this title in the coming weeks. All in all, my afternoon at Sega was a great experience, and it was fantastic to get some hands-on experience with what looks to be the game to revolutionise the FPS genre with its intuitive controls and accessibility to both seasoned and new gamers alike. It’s still a little early to pass judgement but, from my hands-on impressions, the Conduit is looking very promising. We’d like to say a big thank you to Sega for their hospitality and to Kerry and Eric from High Voltage Software for taking time to answer our questions. Finally, remember to stay tuned for the full interview with Kerry and Eric, and be sure to check us for future Conduit-related news! Great job Tom! Wonderful piece. Nice first impressions Tom. You've got me really pumped for this now, preorder GET! Great first impressions! You're a Lucky guy Tom, I'm so envious, I really want to play that game and check if it gives me motion sickness , but seriously it sounds awsome to play, I hope it lives to the hype. Oh crap, I hope you brought your master sword and silver arrows! Nice controls I guess but this game looks really boring to me! I would rather hear more about the new virtua tennis! Clint Eastwood not interested in a shooter? Ptsh! 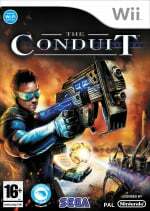 Seriously though, the Conduit was such a great game to play and the controls put people on a much more even playing field than before - it was enjoyable for people of all abilities, not just those dexterous enough to manipulate dual analogue sticks with lethal efficiency. But we will have more news on Virtua Tennis in the next couple of weeks (at a hands-on event). Sliced Goldeneye....Those were the damn dayz! I'll stick with Killzone 2 but it's nice that High Voltage might have finally made a game some people can enjoy. On another note Tom looks like a badass. I'm also seriously pumped for this game now. I had hope from the very beginning and it looks like HVS has delivered. Of course, i will still wait on the reviews before i do buy it to see if that's completely true but i have little doubt. I'm also excited about what HVS will be showing off at E3. I also want VT09 over Grand Slam Tennis now. I trust Sega more than EA. I have a question. You said that in the lobby you voted on the game type for the next match. Now, does that mean you have no control over what type you want to play? If I want to play TDM then is there a lobby for playing TDM only? That was my biggest problem with Halo 3, so if that's in the Conduit I might actually pass on one of my more antcipated titles. 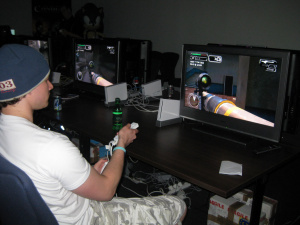 I wonder if the game engine they have created for the Wii will be licensed for further use / modification by other developers, as successful FPS engines often have been in the past. That could lead to some even more interesting titles with more of the budget spent on clever level design or art direction, with no need to reinvent the wheel. Looks good and great impressions. Gears of War 2 so much better . Got bored of COD4, but Killzone 2 is pretty sick. And did you finish CoD4's campaign? It starts off slow but really picks up when censored due to epic spoilers. I'm now looking forward to this neat little shooter for a while now. This is looking like it's really good Wii killer App & I be preording it as soon the preorder is avalanle. Next best thing since Goldeneye -- without wanting to be a cynic I'd argue that Halo 2, CoD4 and Killzone 2 have all already achieved that status; CoD4 probably being the front-runner. Alas, this game does look very good, although I don't particularly see a reason why PC/360/PS3 gamers have reason to be too excited. Well it still is my favourite mindless shooter on 360. And i beat CoD4, 2 times. Once on regular, then on veteran. I don't know which part your talking about but whatever. I plan on buying the GOTY edition sometime soon though. Great story, buying this game purely for the multiplayer so this sounds good. @DaVeMa: There's multiple. One involving a bomb, another involving a missile, and another involving the son of the bad guy (being vague so people who haven't played it won't be spoiled). Those moments make you go "Oh my God. What just happened!?!" In the good way of course. @AlexSays: Buy it. It's absolutely fantastic. Amazing campaign, great multiplayer, extreme replay value. It's a total package. I don't really play very many FPS games but these first impressions have really peaked my interest in a game that I may have otherwise overlooked. Excellent job Mr. Thomas Bowskill! Now I'm off to pre-order this game! I very much look forward to this title. Thanks very much to Tom for his impressions! That bounty mode sounds wicked cool! Sounds great. Not that worried about the eight player matches anymore. Sega has quickly become one of my favorite publishers in these last few months. "– this is potentially the title that could be the next best thing since sliced Goldeneye." Excessive recycled joke is still excessive. Bounty Hunter mode sounds pretty sweet though. Sega = new Nintendo. Sega's games honestly feel more first-party on Wii than Nintendo's now. Plus they don't mind the adult market (God bless you, HOD: Overkill, and your genre)...And they actually release good Genesis games on VC (Super Nintendo's list is disgustingly short, despite being generally high-quality). Sega-if you release it, I will buy. Just please take a knife to the Sonic: Chronicles series...you've done enough damage to Sonic with every other genre as is. 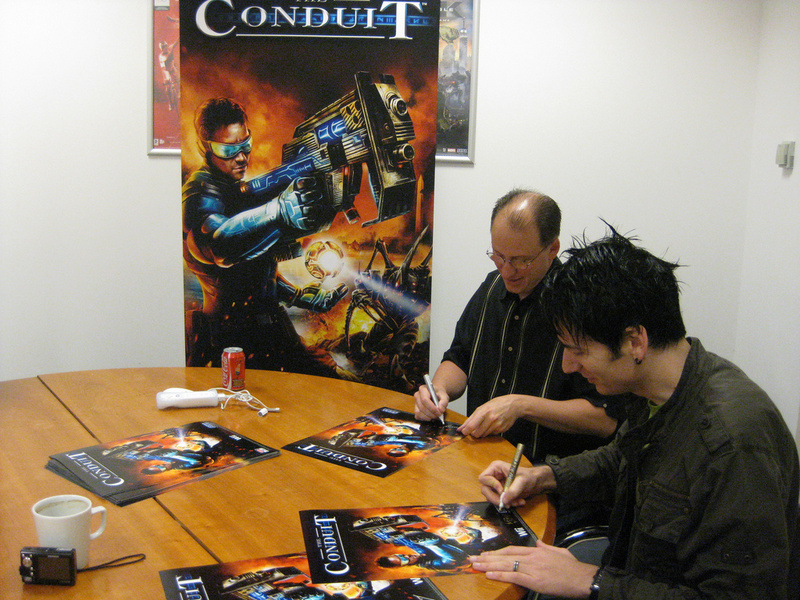 I've decided that I'm saving up to pre-order The Conduit (and get Wii Speak with it). For once, I'm not going to bother with the reviews, this will generally be awesome, I'm certain of it. Better yet, Play are offering a special edition for the game if you pre-order it. Here's what they listed as it's said under the special features. 3: Three unlockable items: Re-skinned all-seeing eye, Agent skin for multiplayer and Drone skin for single-player"
Not exactly the sort of extras You'd expect from a high profile 360 game but, seeing that it's still standard pricing, not exactly too bad. At the very least, it's something to consider if any of you pre-order it. Campaign was good, better then COD5s. But my favourite mission was the sniper one, when your basically just sniping the whole time and stealthy . I liked the last mission, but like the 3 before it were pretty boring. And the son one was ok, the one where your a satelite thing was awesome. @DaVeMa: I was talking about the part of the mission at the very end where he censored himself. I hope this game will sell well. Or at least decently. Or at least not terribly. I want to see more games like this. Well Tom if you're ever feeling down, just look back at this article. "Tom looks like a badass." "One of the best articles i've ever read"
"i have to say it, you-are-hot LOL"
@ Bahamut ZERO -- Oh don't worry, I'm gettin' it. I still don't know what your talking about. Unless its very last mission with pistol. Great part. Favourite part probably. I really cannot wait to sit down and give the Conduit a proper spin. Judging by the interest generated, I think a Nintendo Life fragfest will be in order! And @ Bahamut's earlier question RE: The lobby: I'm not sure on that, unfortunatley; when I got there the game was in full swing and I was too eager to get my mucky paws on it to note down such details. Sorry! @DaVeMa: Gah, never mind. But yeah, the end was awesome. I love how everybody censored. @Nanaki: Aw. Guess I'll have to wait for proper reviews then. Aw well. Are you talking about the son though? ummm i was soo excited before but im disappointed now to the point where i dont want it because there is no local multiplayer. 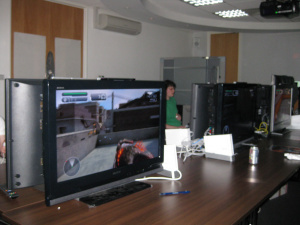 Being able to play with people in my living room has always been wat i wanted in a wii fps n i thot this was gunna be it Seriously, its no fun taking turns on wi-fi, is there ever gunna be a local multiplayer fps on wii other than crappy moh vanguard? Seriously, i had hopes with this one, but i think ill pass now. wait, howcome it says 4 player on ur info thing at the top when they said theirs no local multiplayer O.O!!! THIS CUD BE GUUUUUUD? IS IT REALLY 4 PLAYER??? Whoops, noticed our info is incorrect! Even worse, we don't have a 12 player category (I've reported that to the big guy) so I've popped it to 10 for now (a bit closer to the truth). 1. They are using the Nintendo Component Video Cable (sold separately $29.95). 2. They are not using Wifi, they are using the Wii LAN Adapter (sold separately $24.99) . So if you add Wii Speak ($29.99) that is a total of $84.93 extra in peripherals. Were as all these peripherals are included when you buy an Xbox360.